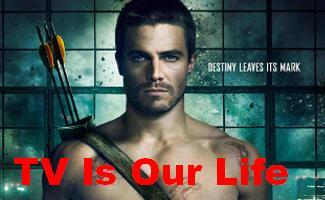 Where to find your favorite "Arrow" actors! Stephen Amell (Oliver) and his brother Robbie Amell will star in and produce the new movie "Code 8." Matt Ryan (Constantine) has joined the cast of "DC's Legends of Tomorrow" on The CW. He also stars in the animated series "Constantine: City of Demons" on The CW Seed. Paul Blackthorne (ex-Quentin) stars in "The InBetween," Spring 2019 on NBC; Matt Nable (ex-Ra's al Ghul) also appears in the series. Neal McDonough (Damien) stars in a new series, "Project Blue Book" on HISTORY, and he has several movies coming out this year. He also will have a recurring role on the second season of Paramount Network’s critically praised drama series Yellowstone, starring Kevin Costner. Emily Bett Rickards (Felicity) has 2 new movies coming out. Katie Cassidy (Laurel) has 2 movies coming out this year and does a voice in a video game. Willa Holland (Thea/Speedy) does a voice in the video game "Kingdom Hearts III." Colton Haynes (ex-Roy) has 2 new movies coming out. John Barrowman stars in a web comic book series called "Acursion." He also does the voice of Merlyn in the video game "Lego DC Super-Villains" and a voice in the animated film, "Fireman Sam: Set for Action!" Audrey Marie Anderson (Lyla) sometimes appears on "The Flash" on The CW. Echo Kellum (Curtis) plays the animated Mr. Terrific in "Freedom Fighters: The Ray" on The CW Seed. Dylan Bruce (ex-Adam) is one of the stars of "Midnight, Texas" Mondays on NBC. Brandon Routh (ex-Ray) and Caity Lotz (ex-Sarah) star in "DC's Legends of Tomorrow" on The CW. Elysia Rotaru (ex-Taiaina) has a bunch of new movies coming out. David Nykl (Anatoly) has a few new movies coming out this year. Colin Donnell (ex-Tommy) stars in "Chicago Med" on NBC. Celina Jade (ex-Shado) has 4 new movies coming out this year. Dylan Neal (ex-Anthony Ivo) has 3 new movies coming out. Celina Jade (ex-Shado) has 3 new movies coming out. Colin Salmon (ex-Walter) plays General Zod on "Krypton" on Syfy and has 4 new movies coming out. Jimmy Akingbola (ex-Baron Reiter) has two movies coming out and appears in the UK series "In the Long Run." Karl Yune (ex-Maseo) stars in the animated series "Fraxtur." Katrina Law (ex-Nyssa) appears in "The Oath" on SONY Crackle and has a new movie coming out. Adrian Holmes (ex-Frank) has 2 movies coming out this year and stars in the new 2019 TV series "V-Wars" on Netflix. Kirk Acevedo (ex-Ricardo) has a new film coming out. Roger Cross (ex-Hilton) has a lot of new movies coming out. Byron Mann (Yao Fei) stars in the TV series "Blood and Water" and will also appear in the new Netflix series "Wu's Assassins" in 2019. Joe Dinicol (ex-Rory) has some new movies coming out and sometimes appears in "Blindspot" on NBC. Kelly Hu (ex-China White) does voices in the animated series "Young Justice" on Cartoon Network and has some films coming out. Parker Young (ex-Alex) stars in the TV series "Pure" on CBC and WGNAmerica and appears in other TV series and many movies. Michael Rowe (ex-Deadshot) appears in the web series "Ninjak vs the Valiant Universe." Annie Ilonzeh (ex-Joanna) appears on "Chicago Fire" on NBC. Eugene Byrd (ex-Andy) has some new movies coming out and does the voice in a video game. Bex Taylor-Klaus (ex-Sin) does a voice in "Voltron" on Netflix and a few movies coming out. Alex Kingston (Dinah) stars in "The Widow" on Amazon. Janet Kidder (ex-Ruvé) stars in "The Man in the High Castle" on Amazon. Michael Emerson (ex-Caydem) stars in "The Name of the Rose" on Sundance TV. Jamey Sheridan (ex-Robert) stars in the new movie "Lizzie". Kathleen Gati (Raisa) has a few movies coming out and still occasionally appears on "General Hospital" on ABC. Mike Dopud (ex-VIktor) stars in "Power" on Starz and has a few movies coming out. Dolph Lundgren (ex-Kovar) has a lot of new movies coming out. Christie Laing (ex-Carly) stars in "iZombie" on The CW. Lexa Doig (ex-Talia) is filming a new TV miniseries, "Unspeakable." Jeffrey C. Robinson (ex-Deathstroke) is the flight/stunt co-ordinator for "Legends of Tomorrow" on The CW. These pages can also be found at our new Wordpress Site.